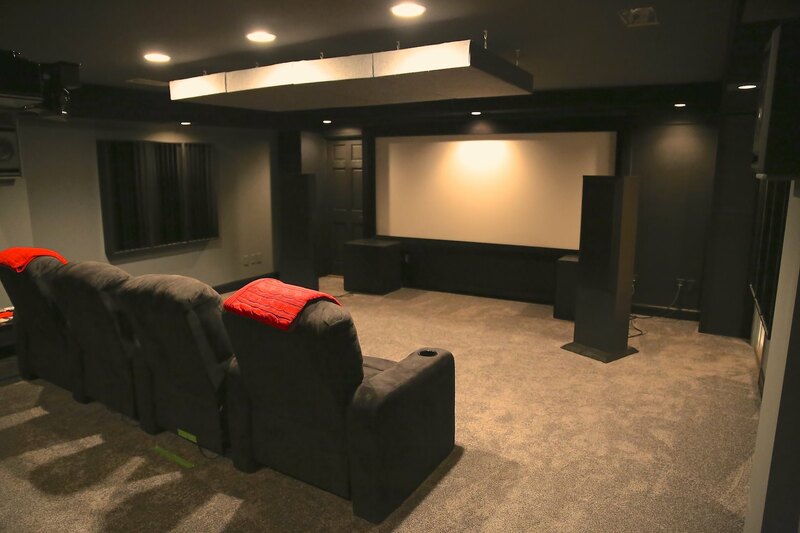 Thought about attaching a new name to our re-done theater/listening room, but .........after looking at the posted photos of the re-completed room, we can not really call this room the "Black Pit" or "The Abyss". Gray columns, mostly gray carpet, and mostly dark gray ceiling. So, we will just leave it as "The Oconee Theater". This "re-decorating" project was all a result of the thread ("The Blacker The Theater The Better The Image") -- and an attempt to make the room look less like a recording studio and more like a theater. At first I was skeptical but tried a few things and it really made a difference. I don't know how to do anything part way .... so I'm not. All of the original room treatment shown in the first photo is still there in the following, but covered with black GOM (or equivalent). The first 5 feet of the ceiling is covered in black velvet. Under the front soffit is covered in black velvet. All wall surfaces/doors are covered in black GOM. The four columns are covered in gray GOM. The first 8.5 feet of carpet was replaced by very (or not so very when compared to black velvet) black carpet. A part of the differences you see in the following photos is the switch (in the first photo) from incandescent 2700K bulbs to 5000K LED bulbs in the "AFTER" photo. And FWIW, the colors in the 2nd and following photos are far more representative of what the room actually looks like - but still not very accurate. GENERAL:The room dimensions are 22 x 19.3 x 8 (actually, the height is 8 feet less floor under-layment, pad and carpet). The room was originally a loft but we fully enclosed it: double dry wall; Green Glue, carpet underlay to reduce sound from creeping into other parts of the house, new doors and door seals and thresholds, sealed all electrical outlets. The room was originally 27 feet long but took off 5 feet to get better acoustic dimensions and to create a separate room for my equipment and media storage and center channel (behind an AT screen). Have 5 dedicated 20 amp circuits with 4 being used: 1 for front subs; 1 for rear subs; 1 for all front end equipment and 1 for amps. ROOM SHORTCOMINGS: When the room was built, one of the design criteria was to provide isolation from theater sounds being heard in other parts of the house - or external sounds from coming into the room. THAT turned out to be a major failure. Second story rooms (and their wooden suspended floors) present obstacles that are difficult to overcome. In this particular room, it was close to impossible due to a shared AC system with the first floor so leakage through the vent system is a given - short of having re-done the AC system for an additional $20,000. I could have done things like double doors, clips and channels but none of them would have addressed the "leaky" HVAC system. So while this room does not do a great job of keep sounds in or out (unlike my previous basement-based rooms), it has to be good enough - and it is! And the "black carpet" was a poor investment. It is simply not black enough to do what I wanted. Better than the "dark gray" that it replaced? Yes and by a large amount. I should either have done a better job of finding a more "black" carpet or built some floor panels covered in black velvet for the first 5 or 6 feet. But I didn't - and won't. 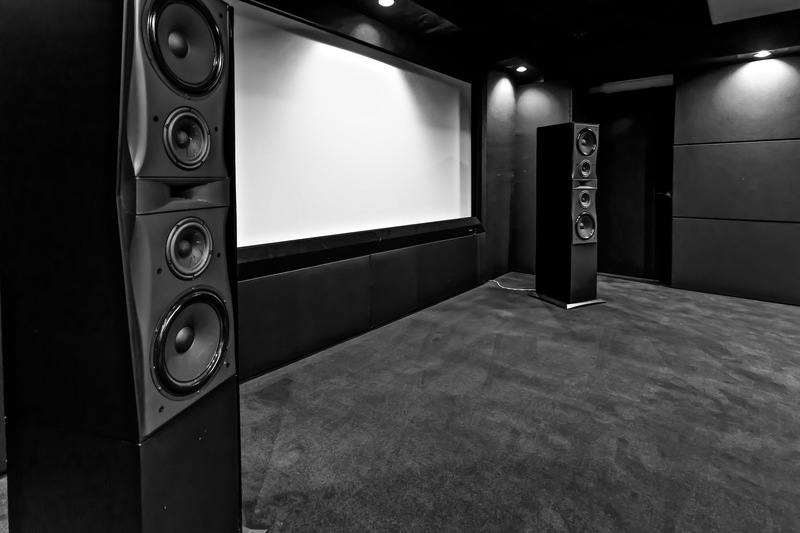 LISTENING BIASES: This room is used for both movies and music. I figured out a long time ago that there is not a 2 channel system capable of recreating a live event in any room - at any price. Multi-channel enhancement of 2 channel music, to my ears, is a huge improvement over 2 channel (still not marginally close to a live event). I used to believe that a great home audio system could at least reproduce a 3 piece jazz combo. But then my wonderful bride surprised me for a birthday and hired a 3 piece jazz combo to play in our home. If live music is 100, then the very, very best 2 channel audio system is a 10 - maybe!!! It is that far apart. So I quit the chase toward perfection (and the attendant expense) and decided to focus on fun. (Still ain't cheap - and it is still an addiction interesting hobby!!!). There are very few pieces of music that don't sound more "fun" to my ears when expanded to multi-channel. In the FWIW department, if you were to sit at the MLP listening to music, you would not know you were not listening to 2-channel - until I switched to 2-channel. Given my age and how long I listened to JUST 2 channels, the transition took a while, but now there is no going back - thanks, in part, to CraigJohn, my RS20i Trinnov Altitude and AuroMatic. I tried both Dolby DSU and DTS:Neural-X for up-mixing but both sounded too processed and nothing close to natural. AuroMatic (actually, this is a modified version of AuroMatic as listening to "real" AuroMatic sounds very bass bloated), with the realtime adjustments possible on the Trinnov (and before that, the Datasat LS10/RS20i), really does make the sound far more enjoyable (real? ; live?) than does just 2 channels. nathan_h, markrubin, Scott Simonian and 41 others like this. Last edited by audioguy; 04-10-2019 at 05:13 PM. Fantastic room and equipment. I bet it is pure joy. Enjoy!!!!! Thank you. The red throw blankets add just the needed touch of color. As noted above, the sound for music (using DiracLive on my server) is very nice. I will need to re-run Audyssey (Pro) as the sound for movies is a bit less than stellar. Since this is the first time I have had a theater on a second story (wooden floor - not a basement concrete floor) the bass response is quite a different tactile sensation. It will take some getting use to. 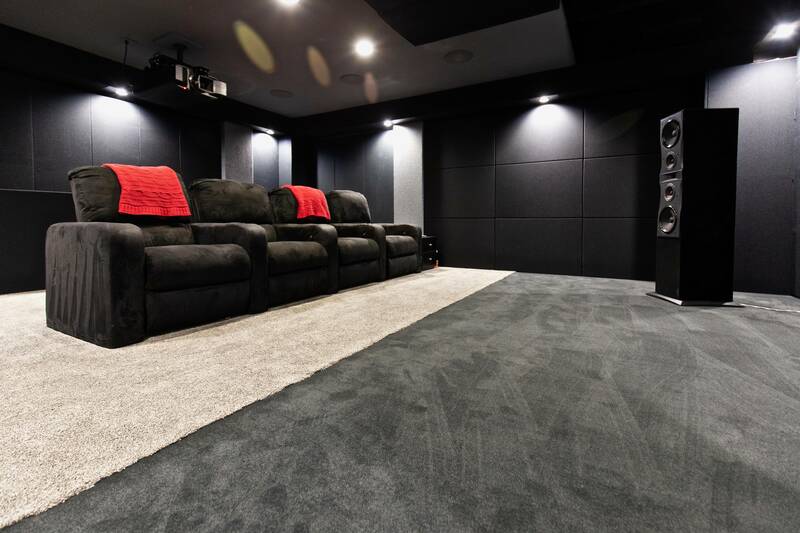 I have kept track of your theater also and LOVE the crisp look of the room as well as the speakers you selected. (And my OCD antenna went hyperactive when I observed all of the vacuum marks on you carpet). What a strange hobby/disease/addiction we have !!!! Last edited by audioguy; 09-03-2018 at 05:50 PM. Enjoy your new room. It is awesome!!! Love the look of your new room. I can only imagine how nice it will sound once you are at 100% complete and done tweaking. Your previous room is still my favorite sounding room to date, so I hope to hear this one some day. Thanks again. I came close to getting JTR speakers for my surrounds because I was not able to get comfortable with a firm date commitment on the release of the thinner profile Sparks. That could still happen. I'm sure your room sounds incredible as well. You have a serious amount of woofage. I can't tell from the photos but do you have any kind of room treatment? Thank you so much. It's a fun hobby (usually)! Happy New Year Chuck. How's the new house coming along? Thanks for checking in. 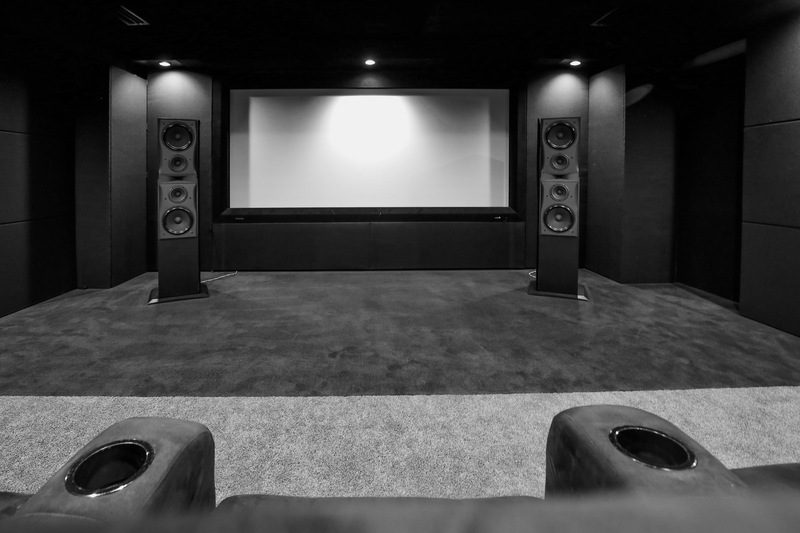 The house is complete and the theater is 98% complete (some cosmetic issues and installing my new Sony 600ES and getting Control4 up and running). Also need to get Audyssey to sound a bit better. That's great news, buddy. So what do you think is different between the two rooms that eliminated the glare? That's great news, buddy. So what do you think is different between the two rooms that nmeliminated the glare? I'm not sure of the cause in the other room nor the cure in this room. I'm reasonably convinced it was the type or placement of acoustic treatment and I did this room a good bit differently. What I do know is that I'm glad it's gone! New Sony 600ES was installed today. All I can say is W OW !!!!!!!!!! Out of the box picture is stunning. Sports Center looks incredible. Watched a few minutes of a couple of Blurays and I am really glad I made this purchase. That's fantastic buddy. So when do we get an invite? As soon as I figure out what is wrong with one of my speakers and re-run Audyssey!! I have a new version of the OmniMic test data disk that has test signals for 5.1 channels. Helped a friend today to use it and by modifying sub distances in his SSP, got virtually flat response in all channels. Amazing. I will be doing the same to my system this weekend hopefully after re-running Audyssey. That room looks really nice Chuck. Your gear and layout are top notch. I see you are running Aud pro but you are also running DIRAC Live? It seems like that's just for music in your system. Can you use it for movies as well. If so, what would happen to the Aud calibration. Would you just not use it? Again, great room and I am on the second floor as well. Although a much smaller room. Upgrade possibilities: The on-wall Seaton Sparks that will fit into the four columns that were sized based upon the rumored dimension. I have no idea when they will be ready for production nor what the price will be. The next upgrade will be to try (it is on order) the yet to be delivered Emotiva SSP that will utilize Dirac, which, at least for music running on my server, is a far superior product (in my opinion) than Audyssey. Dirac give you three choices for measurement: Single seat; Couch; room. And it is VERY carefully spelled out almost exactly where the measurement are to be taken from, and how many. Looks great, too bad DIRAC is not available other than on the DATASAT and Computers! Thanks for the complement. The forever delayed Emotiva SSP will use Dirac and if it becomes available during my life, I will buy one. That said, there are a lot of little tricks you can do outside of Audyssey to allow Audyssey to sound MUCH better than without using these little tricks -- adjusting surround distance to improve envelopment; adjusting sub distance to improve FR of every speaker in the room. Audyssey is an amazing product. I just like the capabilities and audible results better with Dirac. When I run Dirac on my server, it feeds my Integra (for bass management) but I turn Audyssey off. Yes I am only using Dirac for music. Some guys have created the equivalent of an SSP on their server and can run Dirac for movies as well. I will stick with the Integra 80.2 until Emotiva releases their Dirac based SSP. If the Emotive piece is better, I will sell the Integra. If not, I will return it and keep the Integra. And thanks, Mike, for the complement. Got you. So will the Emotiva SSP have both Audyssey and Dirac or just Dirac for everything. Got you. I hope the Emotiva piece is a good one. I don't know much about them except what I have seen on their website. I have used the Emotiva 3 channel amp which I loved (when I had passive surrounds) their preamp (which was really really good) and am currently using their DAC. I'm sure the new SSP won't be up to the standards of a Theta Casablanca but it will also be about 1/10th of the price !! So that's a 7.x channel preamp right? It looks like from your system config that it would work fine but you don't see any need for heights or wide speakers in your setup? I have no doubt that the addition of either heights and/or wides might improve the overall experience, but I have to stop somewhere. I have a 4K projector that throws an image that is hard to describe -- more brightness, better color and better clarity, an anamorphic lens that operates on an automated sled, a new unity gain screen with a new automated masking system each of which allows me to see wide screen film in all of it's glory, speakers that have incredible real and dynamic sound in a well treated room. And through some extension of the Mark Seaton trick of adjusting bass distances in the SSP, we have been able to get very flat response in all 7 channels. Lastly, by didling with the distances of the surrounds, overall envelopment can be vastly improved. I have ZERO complaints nor any desire to add more stuff .... other than an improved SSP. My HT audio and video is as good as I have ever heard/seen at any price anywhere and, my 2 channel music listening is way more than adequate!! And, should I desire to add either heights or wides, I will move the rear surrounds to operate in that capacity. EDIT (Dated June 10, 2015): The above post is incredibly embarrassing. 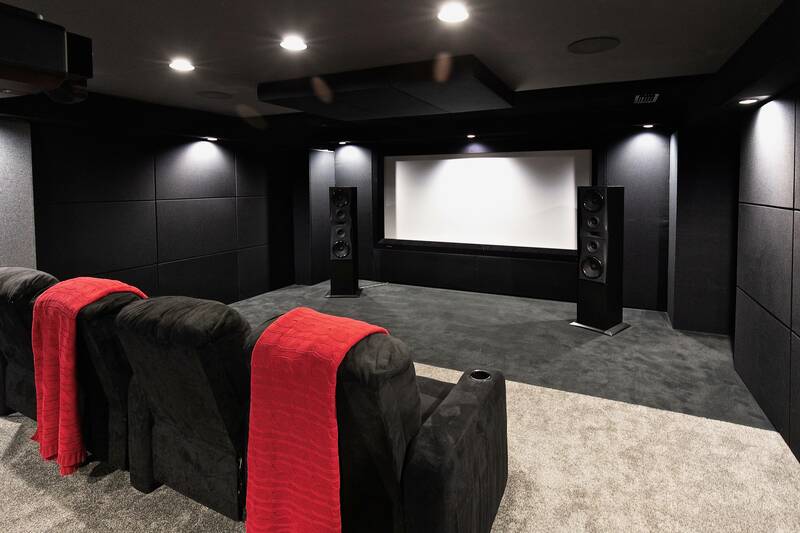 Less than a year after the post, I swapped out my 7 Seaton Speakers for Triad, converted to Dolby Atmos so I changed SSP's added an additional amp to drive the 4 new/additional ceiling speakers and of course added the 4 ceiling speakers. And lastly (for the moment) swapped the Seaton SubMersives for DIY Stereo Integrity HST18's last month. Apparently, this hobby/addiction has no end, retired or not. Marc Alexander and biga6761 like this. Last edited by audioguy; 01-22-2019 at 07:58 AM. That's so great that you have arrived. Your video setup sounds like a real winner as well. It does sound like you are at, or near the end of the journey. I guess the only other thing is if native 4k. I am assuming that if that comes down the pike for movies, you will move into that area and that would be it. But I have no doubt that your system is reference ++.